One of us is a lucky husband to a physician mother, while the other is a physician hospitalist mom who is married to another hospitalist-leader. Together, we share many things: hospital medicine, #JHMChat, research interests, workshops, social circles, University of Chicago, and of course, being parents to young children. We both agree that physician-mothers face an uphill battle when it comes to balancing pregnancy and raising a family in academic medicine. New mothers suffer from sleepless nights followed by a full-days’ worth of work, schlepping breast pumps to and from work, and a profound fatigue that cannot be rivaled by any anything other than pure exhaustion. In essence, new motherhood makes residency look easy. Despite these obvious and well-known issues, it’s probably safe to say that the modern medical culture (despite its focus on patients’ well being and overall health) has lost site on how to properly take care of its newly minted mothers. New research in this month’s JHM by Gottenborg at al, titled, “You Can’t Have It All: The Experience of Academic Hospitalists During Pregnancy, Parental Leave, and Return to Work”, found that women still face many obstacles when it comes to this peri-pregnancy period. In this qualitative assessment of female hospitalists’ experiences around early motherhood, the authors uncovered six common themes related to pregnancy, parental leave, and returning to work; 1) lack of paid parental leave, 2) physical challenges, 3) barriers to breastfeeding, 4) career opportunities, 5) colleague responses, and 6) empathy gain. Paid Parental Leave: As the authors point out, this is rare in academic medicine. Yet research shows that when women are offered paid leave in other fields, they are more likely to stay in their jobs 9-12 months down the road. Given the time, energy, and resources used to recruit these women, doesn’t it make sense to continue to invest in them…? 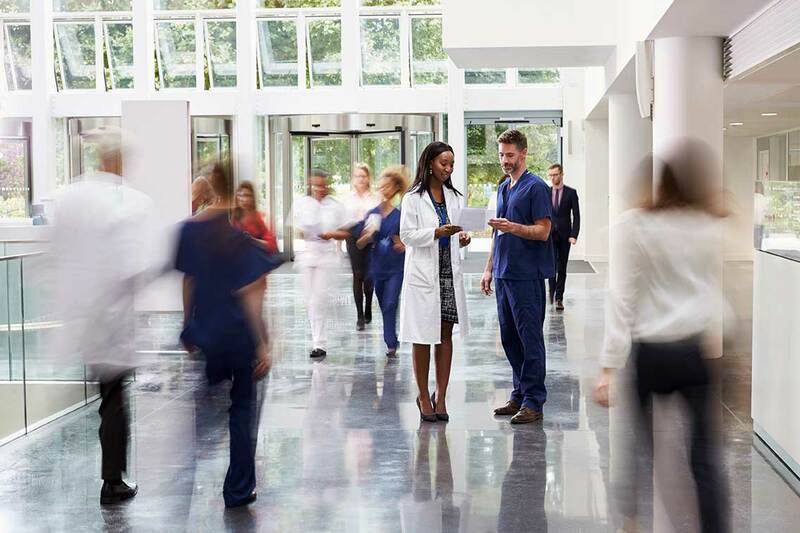 Formalization of Parental Leave Policies: With half of all hospitalists being women, and 80% of them being under the age of 40 – it’s not hard to see that a significant proportion of our workforce will undergo this experience. Hospital divisions would be smart to formalize and structure parental leave policies that are equitable, fair, and flexible to allow women the opportunities to maintain their careers while they also build their families. Additionally, the lack of formalized parental leave policies tends to leave physician mothers in the position to negotiate or “ haggle” with their supervisors (most of whom are men) around these issues. We, as physicians, caregivers, and leaders, can and should do better in this. Time and Space to Support Pumping: While breastfeeding may be glamorized as a magical experience, the truth is pumping is anything but magical. It’s hard enough to pump at work, without having to figure out where and when. Taking a break from rounds to pump is something that should not be shrouded in secrecy, but rather expected for new mothers. This is just a sampling of ideas that could help. We’d point out that the article is accompanied by an eloquent editorial authored by Drs. Carly Benner Zapata and Lekshmi Santhosh, both of whom (like many of you) could be considered experts in this area. 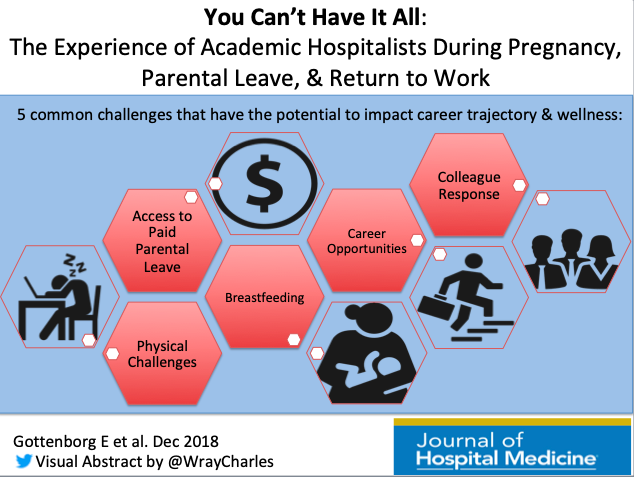 Join us Monday, December 10th at 9 p.m. EST to add your voice and experience for this month’s #JHMChat as we discuss: “You Can’t Have It All: The Experience of Academic Hospitalists During Pregnancy, Parental Leave, and Return to Work” via Emily Gottenborg and colleagues. Not familiar with #JHMChat? Since October 2015, JHM has reviewed and discussed more than two-dozen articles with many focusing on improving the value and quality of care we provide to hospitalized patients. Medical students, residents and practicing hospitalists are encouraged to join, as we discuss a broad array of topics that affect the care of the hospitalized patient. It’s a great opportunity to meet others, learn and even earn free CME. To participate, just type “#JHMChat” in the search box on the top right corner of your Twitter face page, click on the “Latest” tab at the top left of the page and join the conversation. 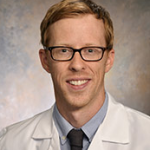 Charlie M. Wray DO, MS is an Assistant Professor of Medicine at the University of California, Francisco and the San Francisco VA Medical Center. He completed medical school at Western University – College of Osteopathic Medicine, residency at Loma Linda University Medical Center, and a Hospital Medicine Research Fellowship at The University of Chicago. Dr. Wray’s research interests are focused on inpatient care transitions, care fragmentation in the hospital setting, and overutilization of hospital resources. Additionally, he has strong interests in medical education, with specific focus in evidence-based medicine, the implementation of value-based care, and how learners negotiate medical uncertainty. Dr. Wray can often be found tweeting under @WrayCharles.